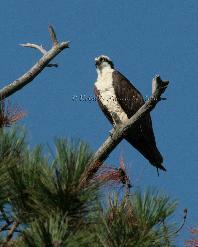 The Osprey like it�s fellow raptor the Bald Eagle was endangered in the 1950�s. Many people mistake the Osprey for the Bald Eagle. But the Osprey is slightly smaller. It also has black eye stripes and white under belly. It's flight patterns are also different than the Bald Eagle which makes it easier to distinguish it from an immature Bald Eagle (which also has similar markings during it's various stages of maturity). Although the Osprey and Bald Eagle generally live in similar habitats, the Osprey actually enjoys living in human habitat also. Telephone poles etc make great nesting sites for it's stick and sod nests. Artificial platforms are happily accepted by the Osprey . In fact the Osprey pictured above lives in the middle of a softball diamond on a light pole. Unfortunately the nest has not been successful the past two years. Therefore the McGills have not been able to get any shots of young. Teresa is still trying to capture a great shot of this superior diver in action. 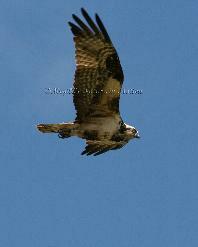 Osprey can dive 30 feet into the water to capture a fish in it's curved talons. 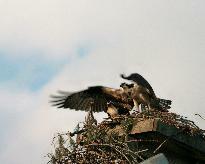 The Bald Eagle quite often forces the Osprey to drop it�s catch. Then the Bald Eagle retrieves it in midair. 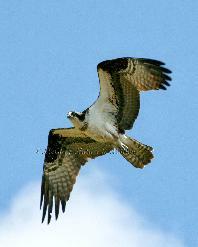 Unlike the Bald Eagle the Osprey being predominately fish eaters definitely migrates south. It quite often migrates as far as South America. 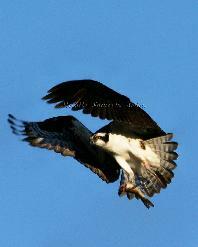 The Osprey can live up to thirty years in the wild. 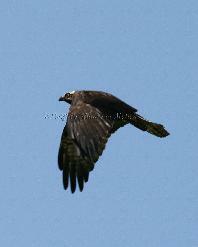 It has a wingspan of five to six feet and length of 21-23 inches with a weight of three to four pounds.